I’m a big fan of mementos and souvenirs, but not so much in the traditional sense. Yes, I buy t-shirts and hats when I visit a new place, and I tend to snap a picture here and there when I travel. My favorites though, remind me of people. 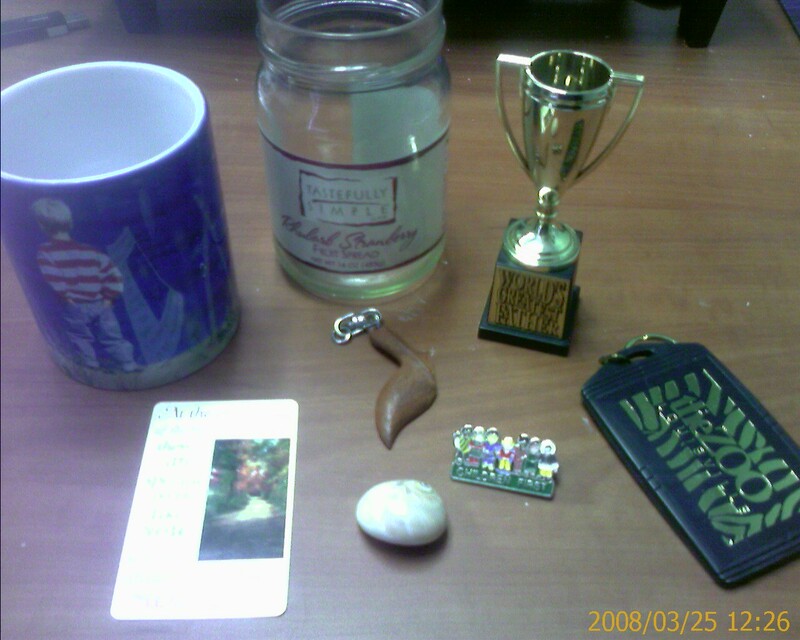 Below are a handful of the mementos that I have on my shelves, in my desk drawers, and scattered around my office. The top drawer of my dresser has even more. What is it about such things that compels me to keep them? In the picture above, each item represents a person (or a couple of people) that have touched my life. They represent family and best friends. There are more things that I’ve kept, of course, representing other friends and family, and these aren’t necessarily the most important items I’ve kept as memories of someone. For example, at my home, I have a wooden boat that my father hand-carved. It’s extremely simple, but looking carefully at it I’m reminded of his love for simple engineering, attention to detail, and his willingness to stay up all night, helping one of his sons with a “build a boat” project that was due for school the following morning. I have kept that boat as a reminder of the sacrifices that Dad made, as well as a reminder of sacrifices that I need to make as well. I keep pictures of people, as we all do, but for me, it’s the things that people have touched and used that I want to keep. Things that were handed to me, in person, and things that were given to me as gifts. Things that, even now, as I pick them up, I know that the other person once held. The boat that Dad carved, for instance, was in his hands for hours. I’ve often wondered if, in the intervening years, I have held it in admiration longer than he held it in creation. Likewise, one of my favorite drink containers was a hospital-issue, insulated ice jug. Mom brought it home after one of her stays, and then continued to use for years after. I can’t pick it up or hold it without a flood of memories of her, and the various times and places where she held it. Jerry Seinfeld used to do a comedy bit about looking for the perfect box. All of us were looking for a box to hold this or hold that. When we die, maybe our coffin is that perfect box. I noted, with a bit of amusement, that I have maintained a box of stuff as I’ve changed jobs over the years. Not content with keeping memorabilia around the house, I’ve now got a cardboard box full of stuff that reminds me, not of the places that I’ve worked, but of the people I’ve worked with. Hopefully, each of you have a box, filled with tangible things you can put your hands on, each of which will remind you of someone who touched your life. I wouldn’t trade the items in this box for anything… except maybe a few more minutes with each of the people who touched the items before I did.